Spend the 25th (Sat) wandering through the wild on a nature and wildlife tour. Plan for a day of cool, family-friendly fun on the 29th (Wed) at Darwin Waterfront. The adventure continues: examine the collection at Defence of Darwin Experience, take an in-depth tour of RFDS Darwin Tourist Facility, cool off at Wave Lagoon, and get some thrills on the water with a speed boat tour. To see more things to do, other places to visit, traveler tips, and tourist information, use the Darwin online trip builder . Singapore, Singapore to Darwin is an approximately 9-hour flight. You can also do a combination of bus and flight. The time zone changes from Singapore Time to Australian Central Standard Time (Northern Territory), which is usually a 1 hour difference. Traveling from Singapore in May, plan for a bit cooler nights in Darwin, with lows around 26°C. Wrap up your sightseeing on the 29th (Wed) to allow time to travel to Batchelor. Explore Batchelor's surroundings by going to Litchfield National Park (Helicopter Tours, Wangi Falls, & more), Robin Falls (in Adelaide River) and Crazy Acres (in Berry Springs). 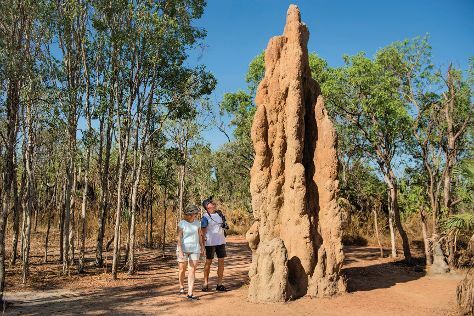 Spend the 30th (Thu) exploring nature at Litchfield National Park. To find traveler tips, reviews, maps, and more tourist information, read Batchelor tour itinerary builder site . You can drive from Darwin to Batchelor in 1.5 hours. In May, daytime highs in Batchelor are 38°C, while nighttime lows are 26°C. Wrap up your sightseeing by early afternoon on the 2nd (Sun) to allow enough time to travel back home.